An egotistical surgeon hires amateur P.I. Gil yates to determine whether his amiable son-in-law's fatal fall was suicide. $23. "There's a real mystery to be solved here, but the greater pleasure for readers is listening to Gil's quirky voice and meeting Boyle's cast of weird and wonderful characters. This book was a long time coming, but oh boy, was it worth the wait!" "A ten acre wonderland few have ever seen." "An elegant book...a tantalizing mystery of art and botanical wonders in Santa Barbara's backyard. An inspiration for gardeners determined to decorate their yards using a personal touch with colorful plants and whimisical art." "Champion's knack for mixing mystery with the absurd gives his work an edge akin to Hiaasen and Evanovich. This continues to be a t00-little-known series. A little hand-selling might make all the difference." 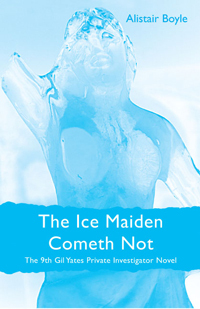 The Ice Maiden Cometh Not is also available as an ebook. Bomber Bombs is also available as an ebook. When Bones is accused of a mysterious crime, it's up to the Duchess to solve the mystery and clear his name. Third in the series. Seven unforgettable dinner companions convene at table 13—all living the dream of cruising the world's most colorful ports. "Gardner's best novel yet: With engaging humor, his diverse characters are stunningly drawn..."
"Containing by far the most breathtaking photography of any book in this season, Lotusland is an exquisitely executed work of art." Contact Allen A. Knoll to order a catalog or request additional information.